MOSCOW -- The partner of Russian dissident best known for his politically charged performance art -- including nailing his scrotum to Red Square -- says he has been transferred to a psychiatric hospital. Pyotr Pavlensky's partner, Oksana Shalygina, told The Associated Press on Thursday that the artist was transferred the previous day from jail to a psychiatric hospital for evaluation, lasting up to 21 days. In 2014, Pavlensky was arrested over a protest he called "Segregation," which saw him cut off part of his earlobe while sitting on a wall outside a government-run research center for forensic psychiatry. He said that protest was against the use of forensic psychiatry for politically motivated purposes. He cut off his earlobe to demonstrate how authorities could "cut off" an unwanted individual from society by using psychiatric and medical diagnosis to forcefully send a person to a penitentiary hospital, according to Pavlensky. In Soviet times, political dissidents were often moved to psychiatric hospitals to discredit them. 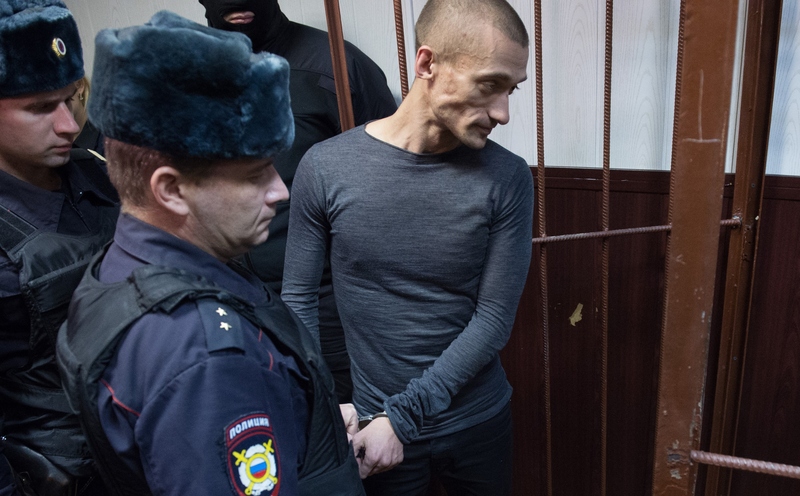 Pavlensky was arrested and jailed in Moscow in when he set fire to the doors of Russia's security services. The artist has also been charged with vandalism in St. Petersburg over a previous incident, according to his lawyer Svetlana Ratnikova.